At Highline Ballroom on Thursday last, The North Mississippi AllStars performed a mammoth two-and-a-half hour set of their outstanding blues-rock that was truly a family affair in more ways than one. The trio was joined on stage by a revolving group of guests from openers Hill Country Revue, that culminated in an appearance by long-time collaborator Robert Randolph. As Hill Country Revue also contains two members of NMAS, the entire night was essentially a four-hour smorgasbord of country, boogie, blues and honky tonk. We recorded this set from directly in front of the soundboard, centered between the two main PA speakers. The four-track R-44 was utilized again, but this time to its maximum value. We positioned the Neumanns directly at the stacks and spread the DPAs in a 110 degree placement to capture a full round spectrum of sound available at this venue. We are extremely pleased with the outcome. Enjoy! This show is now available to download as FLAC or MP3 at archive.org [HERE]. 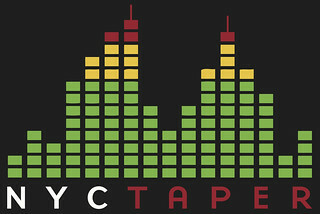 If you email nyctaper for access to this recording, we expect that you will PLEASE SUPPORT North Mississippi AllStars, visit their website, and purchase their available releases through The Store at their website [HERE]. Wow this is awesome. I was at that show, I always like to have a copy of shows I saw in person. Do you know if Hill Country Revue’s set is out there?